Early in BO's administration Ann Coulter recommended the elimination of the Departments of Health & Human Services, Education, Commerce, Agriculture, HUD, Transportation, the EPA, the National Endowment of the Arts, the National Endowment for the Humanities, & the progressive income tax & instituting a flat tax. 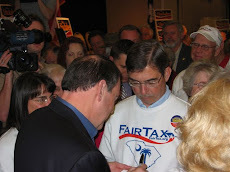 At the time, I seconded Ann's recommendation except I recommended eliminating the progressive income tax & replacing it with the FairTax. The above graph shows the relationship of so-called federal Mandatory spending1 (growing as a percent of total spending) – mostly entitlements like Social Security, Medicare, & Medicaid – & federal Discretionary spending (declining as a percent of total spending) – like the topics Ann Coulter listed above plus items like Defense. The so-called Mandatory entitlement topics are funded automatically, following the practice of continuing from year to year with no required input from Congress, hence they are on autopilot, whereas the Discretionary topics must be voted on & appropriated each year by Congress. 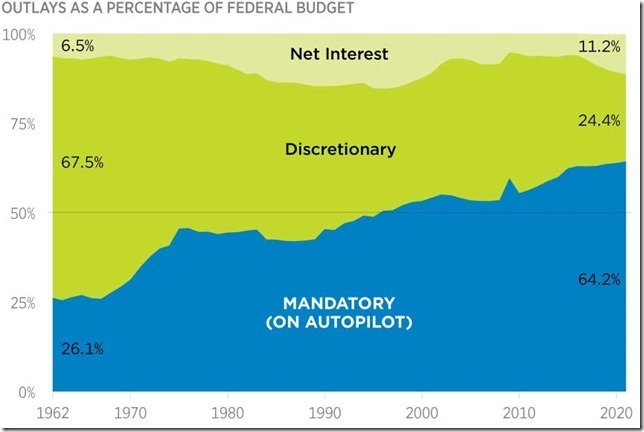 Since both Mandatory entitlements & Discretionary spending are each increasing in actual dollar amounts the above graph means that Mandatory entitlements are increasing faster than Discretionary spending. 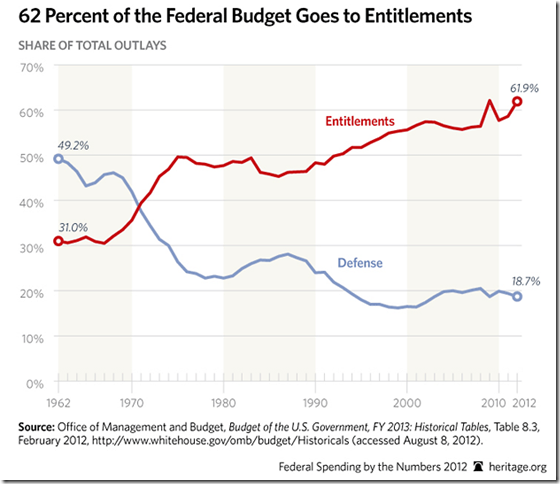 The Heritage Foundation reports that from 1992 to 2012 real inflation-adjusted (2012 dollars) Mandatory entitlement spending increased by 110% from $976 billion to $2,053 billion while Discretionary spending increased by 60.5% from $803 billion to $1,289 billion. Over this twenty year period total spending (includes net interest) grew 71% faster than inflation. 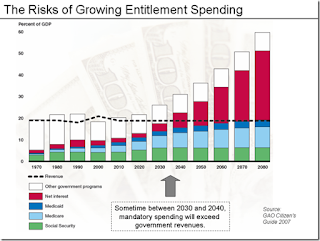 The point is that even if the above recommendations for eliminating the Discretionary programs – although significant - were implemented, the Mandatory entitlement & net interest portions of the federal budget would soon overwhelm the revenue projections. 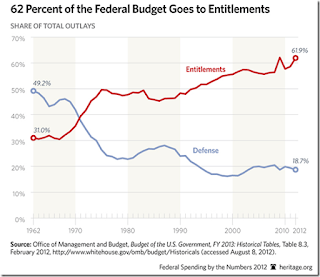 See graphs below that show how Entitlement & Interest are crowding out other spending & how Entitlements & Defense spending have reversed positions over the past 50 years. 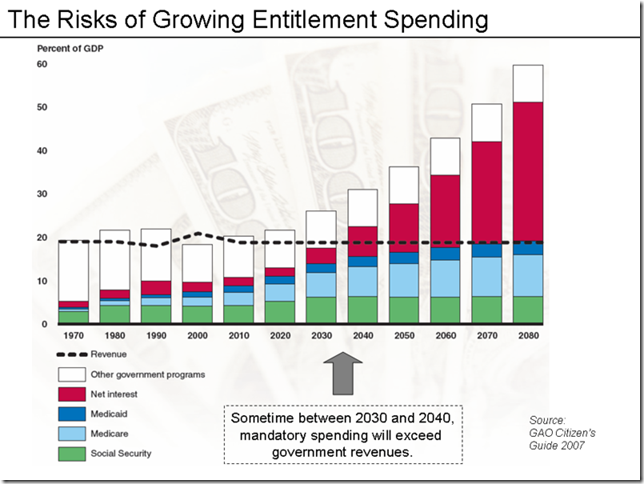 The graph below shows that between 2030 & 2040 Mandatory entitlement spending plus net interest will exceed government revenue. Of course the portion of government revenue available for Discretionary programs becomes less each year during this time if no corrective action occurs. The Washington Examiner reports that Trump's plans call for 10% spending cuts & a 20% reduction in federal workers – all in Discretionary programs but no cuts or reductions in Social Security or Medicare. Trump also is looking to reduce federal spending through attrition, a hiring freeze he has already authorized, & reorganization as well as making bureaucrats accountable to the American taxpayer. Most significantly Trump has said that he will reduce federal regulations "by 75% or more" - the total business cost of compliance of federal regulations has soared (cost of compliance in 2012 was $2.028 trillion in 2014 dollars) – the annual compliance cost burden for an average U.S. firm is 21% of its payroll thereby leaving little or no room for investment of any kind so this reduction in regulations will have a liberating effect on businesses & therefore the economy. Trump's selection of SC Congressman Mick Mulvaney, one of the nine founding members of the House Freedom Caucus – a group of about three dozen House Republicans that support limited government, the Constitution, & the promotion of liberty, safety, & prosperity - to head the Office of Management & Budget (OMB) only adds to the impression that spending cuts & addressing the deficit will be a top priority in the Trump administration. Mulvaney favors a balanced budget amendment to the Constitution & has recently learned Spanish so he can appear on Spanish-language TV to explain the importance of the various programs to Hispanics. Congressman Mulvaney is considered a deficit hawk & was grilled in his appearances before the Senate budget & homeland committees particularly by Senator McCain who pointed out that Mulvaney chose fiscal responsibility over defense spending in his years in the House. Mulvaney is one of several Cabinet nominees whose positions directly contradict Trump's campaign pledges – in this case especially pertaining to Trump's pledge to continue Social Security & other entitlements as they are. Trump has already said no to wasteful spending when he challenged Boeing regarding the $4 billion cost of a new Air Force One – see Tweet below. Retired Oklahoma senator Tom Coburn still identifies waste, fraud, & redundancies each year – totaling $400 billion in 2017 that Mulvaney will be sure to consider. 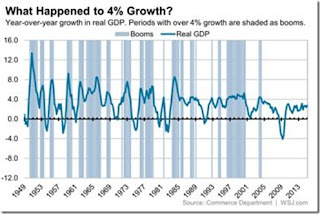 Trump plans to solve most of the country's budget & financial problems by meeting his aggressive annual economic growth assumption of 4% year over year growth in real GDP ("we think it could be 5 [percent] or even 6 [percent]. We are going to have growth that will be tremendous."). This type of growth has been realized before – see graph below. In fact it is low by China's recent standards. 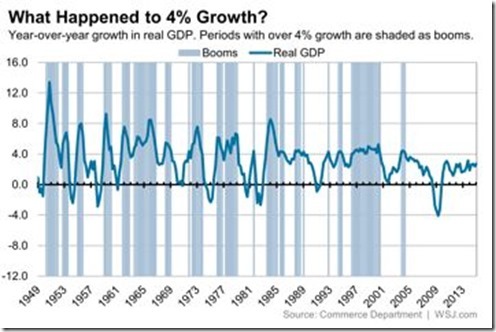 By comparison, GDP growth under BO averaged 2.1% for the seven & one half years since the recession ended in June 2009. But entitlements, like Social Security, don't totally cooperate with the Trump/Mulvaney principle that the best solution to any budget problem is faster economic growth. Economic growth is a measure of a country's economic health – more jobs, prosperity, & wealth will be created with fast economic growth than with slow economic growth. Prosperity & wealth creation for people in the middle class are functions of wages which in turn increase with increasing productivity. These are the principles that built a strong America – long before Social Security appeared in the 1930s. 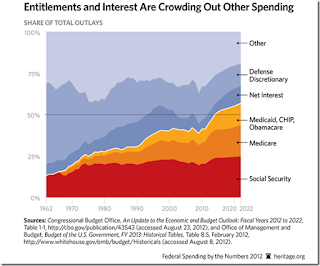 The problem with the major entitlements of Social Security, Medicare, & Medicaid, & we are experiencing it right now, is that their liabilities are growing faster than inflation or real GDP. 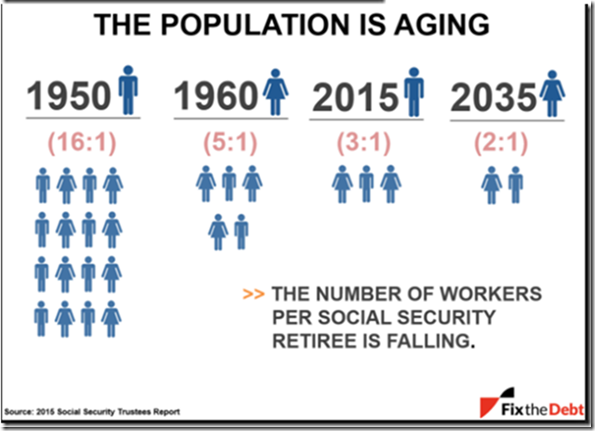 The declining ratio of workers to retirees (see table below for Social Security) means that entitlement payments to beneficiaries won't be able to keep up with the future liabilities of the entitlement programs which in turn will overwhelm the economy. For instance, when three workers currently working in 2015 retire they will receive benefits based on two workers funding the system in 2035 – this is unsustainable. Social Security was originally a pay as you go system meaning that benefits are provided by current payments like payroll taxes. In the 1980s & 1990s the baby boom generation's payroll taxes exceeded the annual amount of benefits paid & the surplus was used to create a Social Security trust fund. Today Social Security is funded as shown in the following graph – meaning it is a hybrid combination of pay as you go & a fully funded insurance scheme. Net interest income refers to money taken from the trust fund. 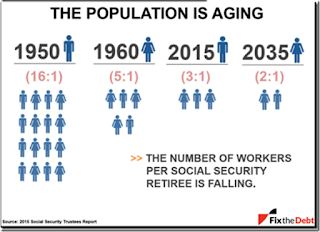 The problem is that the number of retirees in the baby boomer generation grew much faster in the 2000s than the number of workers & this phenomenon is projected to continue – see graphic below that shows a 3:1 ratio in 2015 & a 2:1 ratio in 2035. The initial amount of a person's Social Security retirement benefit is indexed to real wage growth so the faster the economy grows it can be expected that real wages, & therefore the Social Security liability, will grow commensurate with it. The calculation for benefits switches to consumer price index adjustments once a person starts to collect their retirement benefit. There is a little more to the calculation but I think this summary suffices for the purpose of this post. 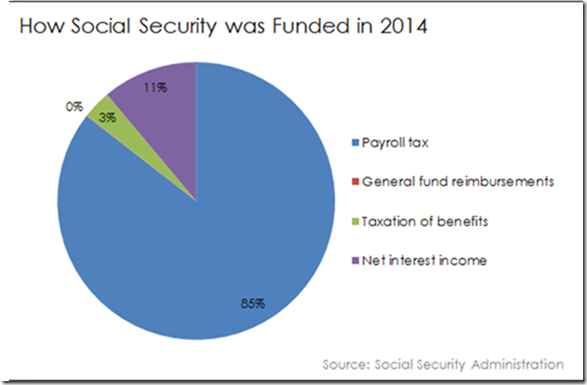 The 2016 annual report of Social Security's trustees indicates that the above graph for funding Social Security will change & that by 2034 the trust fund will be depleted & there will not be enough workers to maintain the projected level of benefits from the projected payroll tax level; accordingly, a 21% across-the-board benefit cut will be necessary unless Congress raises payroll taxes by a like amount. Social Security has been paying out more in benefits than it collects in taxes since 2010. Healthcare spending comprises almost twenty percent of the economy & it also grows faster than general inflation or real GDP. 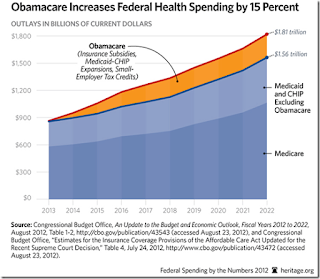 The growth, & hence liability, of Medicare & Medicaid falls right in line; in fact, John Fund reports that the individual spent 50% of healthcare dollars when Ronald Reagan was president – today it is 12% so it is only human nature for this growth in healthcare spending to occur because people do not think they are spending their own money. This uncoupling of spending & personal responsibility is a large driver of the rapidly rising costs of both healthcare & healthcare insurance. 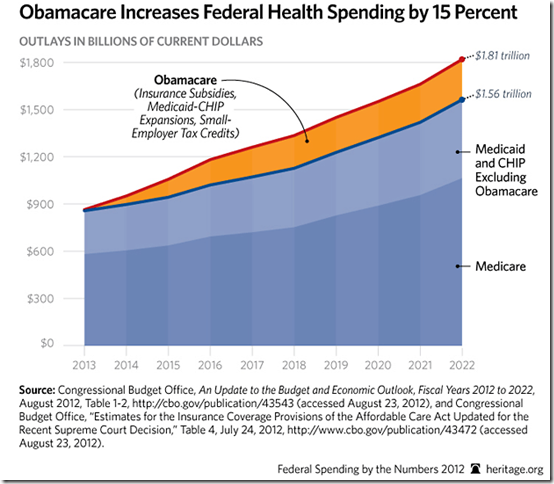 See graph below that shows the projected growth of the federal government's healthcare spending including a projection of ObamaCare if left unchecked. The 2016 trustees annual report for Medicare, the federal government's healthcare insurance program for people 65 years & older, said Medicare's hospital-insurance trust fund will exhaust its reserves by 2028 – two years sooner than projected in 2015 – after which reductions, projected to be 13% below current levels, will have to be made to that program if there is no action taken by Congress. Medicare Parts B (doctors) & D (drugs) are both financed by a 75% subsidy that comes from the general tax revenue collected by the U.S. Treasury. Medicaid, the government insurance program for people of all ages whose income and resources are insufficient to pay for healthcare, is funded by the federal government providing funds from the general treasury to the states based on each state's per capita income ranging from 50% for high income states to 75% for low income states. The individual states make up the difference in providing Medicaid services to the poor. 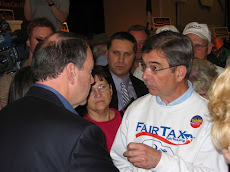 Now Trump has repeatedly said he wants to protect Social Security & Medicare spending with no cuts or changes, but his choice for OMB director Mick Mulvaney prefers to reduce spending on both programs as well as raise the retirement age eligibility to join the programs, reduce benefits for younger workers, & raise the Social Security payroll tax cap – Medicare has no payroll tax cap. The future of Medicaid is unknown since it is also a large part of ObamaCare which is being considered for repeal by Trump. This post shows the relationship of Social Security, Medicare, & Medicaid to economic growth – & it is a complicated one. But the post clearly shows that the only real long term autopilot feature of these programs is the automatic reductions in benefits – 21% for Social Security in 2034 & 13% in Medicare's hospital coverage in 2028. For my solution to solve America's entitlement problems that will return us to the liberty to abundance stage of our history click on the two referenced posts below. 1several places in this post referred to the subject entitlements as so-called Mandatory spending on autopilot – this is a misnomer. There is really nothing mandatory about the programs. Congress can change Social Security benefits in an instant regardless of how much or how long people have paid into the system – the annual notice Social Security mails to people who have not set up a Social Security account says so (from page two of sample statement on the Social Security website – "Your estimated benefits are based on current law. Congress has made changes to the law in the past and can do so at any time. The law governing benefit amounts may change because, by 2034, the payroll taxes collected will be enough to pay only about 79 percent of scheduled benefits.") & so did the Supreme Court in 1960 in Flemming v. Nestor & 1937 in Helvering v. Davis – this is where the aforementioned 21% reduction in benefits comes into play or additional taxing of benefits like those that occurred in the 1980s & 1990s. Medicare & Medicaid programs can likewise be changed or eliminated by Congress. 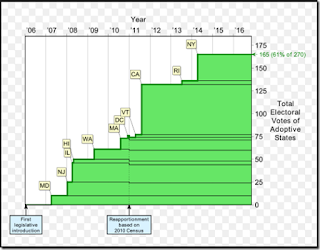 During BO's two terms as president, Democrats lost the 60-vote supermajority filibuster proof senate, as well as control of the House, Senate, & presidency, plus over nine hundred seats in state governments & twelve governorships. Trump will reverse everything that BO has done or tried to do to America. That is BO's legacy. Before the evening of November 8 far too many Americans had been feeling out of place in their own country. What with: 22) the Iran nuclear deal including the delivery of pallets of cash in Swiss francs to Iran under the cover of darkness – this alone tells you something is rotten here, & 23) BO's trying to close the Guantanamo, Cuba prison & return the terrorist prisoners being held safely there to the battlefield or worse yet to America. Full disclosure - the above what with list was made off the top of my head over a month ago. I held this post until January 20, until right after 12 noon, because I knew BO's fundamental transformation of America, for the worst, would not be done until the very minute he left office. Please feel free to add to the list any items that have surfaced in the past month where BO has deliberately undermined the American heritage of freedom & liberty. In fact to prove the point, name one thing BO could have done, if he wanted to harm America, that is not on the list. A point Newt Gingrich has made also. With such a list like the one above revealing BO's intentional destructive plan of ruin for America it is not surprising that almost half the electorate thought America's best days are in the past – source Rasmussen. In addition, according to the July edition of the Journal For Democracy one in four Americans do not support democracy & an even larger number prefer an authoritarian figure so we don't have to deal with the nuisance of elections – a quarter of millennials hold favorable views of Lenin, 18% think favorably of Mao, & more than 10% have positive feelings about Stalin – three men who murdered tens of millions & impoverished hundreds of millions – source: Victims Of Communism Memorial Foundation (VOC). VOC also found in their Annual Report on the U.S. Attitudes towards Socialism, released on October 17, 2016, that Bernie Sanders' philosophy had more support than Professor Friedman's, only 37% of millennials & 38% of Generation Z (16 to 20) had a very unfavorable view of communism, & that 53% of millennials believe America's economic system works against them. Click here to read the aforementioned report that gives all the statistics & information that shows where the country was heading if Bernie or Hillary had been elected. During the presidential primary campaign a WSJ/NBC News poll found that 71% of Republicans felt uneasy & out of place in their own country – even 12% of Democrats felt that way very strongly. This set the stage for a Trump electoral victory. In winning the presidency Trump already has reached some of Romney's 47% – "people (who) will vote for BO (in Mitt's case) no matter what . . . these people are dependent on government, believe they are victims entitled to government handouts, & pay no income tax." In brief, Mitt accurately described people prone to vote for government-dependence candidates like Hillary Clinton – until Trump gave some of them immediate hope for a better way. To be successful in turning America away from the socialist instincts that started to enter Americans' lives right after World War II Trump will have to reach even more of Romney's 47% because the American youth is enamored with socialism - the Pew Research Center found in 2011 that 49% of people aged 18 to 29 viewed socialism favorably while 46% viewed capitalism favorably – & this trend has only grown worse as evidenced by Bernie Sanders popularity during the primaries & Gallup's confirmation both last May that 55% of 18 to 29 year-olds have a positive image of socialism & June, 2015 that almost 70% of millennials would be willing to vote for a socialist presidential candidate. In fact these polls were proven true in that Bernie received more primary votes from under-30 voters than Trump & Hillary combined. The WSJ reports that nearly one fifth of males between the ages of 21 & 30 (18.5%) who haven't completed college aren't working today & aren't in school. This is up from 15% in 2000 & from 17% when BO took office. Yet many of these young men are satisfied (short sighted) with their situation because it frees up time to play videogames - WSJ source - the University of Chicago's Erik Hurst & colleagues. Now there is plenty of evidence that millenials do not know what socialism is or what its inherent miseries are – many think the term refers to social media. But we can also certainly say that millenials do not know what capitalism is either, since they have never lived in a capitalistic economy – America is a mixed economy that is over 50% socialist that millenials know, have lived in all their lives, & were told was capitalism. When they finally see first hand the prosperity that capitalism brings to their lives through the dignity of holding a job, as promised by Trump during the campaign, & creating their own wealth for themselves, the hold that statist Democrats have on them will be loosened & Romney's 47% (& the 53% of millennials mentioned above who believe America's economic system works against them) will be further reduced - that is what some of Romney's 47% envisioned when they voted for Trump. During the last 35 years two billion people have moved out of poverty because of capitalism – source James Pethokoukis of AEI. Trump, as the polar opposite of Hillary & BO, gives millenials a chance to move away from the stagnate deception of their insincere collectivist upbringing where they were never taught the havoc that a mixed economy with ever increasing statism would bring. But with the election of Trump a few of Romney's 47% have started to figure out that government-dependent welfare is a life long poverty trap that far too many people have spent their whole lives in – the ones who voted for Trump want & see something better. They have the idea that the struggle for prosperity comes down to do you want more government or less? They want to reverse the trend where people have become more interested in getting government benefits than earning a paycheck. Where Hillary voters saw more mediocrity in her than greatness, & were satisfied with that, the people who turned the election for Trump @ the margin saw the opportunity & took the chance on a leader who would put America first, who would make America great again, & who would work to return prosperity to America. It has been twenty-eight years since America has had such a President – one who didn't make you feel out of place in your own country. The December 2016 unemployment report released on January 6 by the Department of Labor - Bureau of Labor Statistics (BLS) – is the last such full month report of BO's presidency. RTE did more analysis of the monthly BLS unemployment reports the past eight years than any other single topic – none of the unemployment reports were good including this last one mostly because of BO's attitude displayed in the above cartoon caricature that showed his dislike & contempt for the job creators of this country. Under BO's administration the average annual growth of the economy has been 2.1% since June 2009 when the recession ended – the weakest expansion of the post World War II period. More jobs will be created under strong economic growth than BO's deliberately contrived weakest on record. This post presents the problems Trump must solve to become the jobs president he wants (& needs) to be. In summary, massive regulations, higher taxes, & the certainty that both would increase under BO has forced entrepreneurs to wait for another administration before moving forward with investments that would increase economic growth, jobs, productivity, & accordingly everyone's standard of living. With Trump being one of the world's most successful businessmen we have a real chance to reverse the Death Of Democracy spiral & return to the liberty to abundance stage of our republic. Over the past eight years we have learned to not pay much attention to the government's official unemployment rate – U3 - the proportion of the civilian labor force that is unemployed & actively seeking employment as defined by the BLS. The unreliability of this measure has always been true but in normal economic times U3 would suffice to give an accurate portrayal of the health of the job market. It breaks down in severe economic conditions like BO purposely induced on America his entire time in office. U3 increased in December to a 4.7% unemployment rate from 4.6% in November but to understand the dynamics of the job market you have to look to the U6 unemployment rate that is still elevated @ 9.2% – the pre BO low for U6 was 7.9% so there still is a way to go. U6 is the most comprehensive measure of unemployment & currently totals 14.8 million people. It includes the total unemployed (7.5 million), plus all persons marginally attached to the labor force (1.7 million), plus the total employed part time for economic reasons (5.6 million). The 1.7 million people in U6 listed as marginally attached to the labor force wanted & were available for work, had looked for a job sometime in the prior 12 months, but were not counted by the BLS as being part of the labor force because they had not searched for work in the 4 weeks preceding the December unemployment report. As the discouraged workers in this group start to look for work again they are counted as part of the labor force which in turn affects the U3 unemployment rate calculation. When people drop out of the labor force U3 can go down as was the case in the early years of BO's presidency & when people return to the labor force as they did last month U3 can go up like it did. Of course the most important questions pertain to the quality of the jobs people hold & the wages they pay. For instance some part-time workers counted as employed by U3 could be working as little as an hour a week which would not be a quality job by any measure. To present the clearest employment picture a U7 category is necessary. U7 would take U6, the current most comprehensive measure of labor resource unemployment & underemployment, & add those employed full time who make a fraction of their former pay. For instance if you used to make $50,000 to $75,000 per year & now make $25,000 per year you are counted as employed by U3 & U6 for that matter – but U7 would provide the detail to show the unhealthiness & misery of the economy. It would reveal the number of people relying on wealth spend down to maintain their standard of living commensurate with a $50,000 to $75,000 per year income – the opposite of wealth creation - that would continue "until they were reduced to hunger & rags" in the words of Isabel Paterson. A subset of the U6 category is new college graduates who haven't found a job in their field of study & very possibly never will. A 25 year old unemployed or underemployed college graduate who graduated three years ago is not only in competition for a job in their field of study with more experienced people but also with new 22 year old graduates – a losing proposition that means these older graduates, many with tens of thousands of dollars of student loan debt, may never work in their chosen field of study. But even worse off are the nearly 20% of males between 21 & 30 (up from 9% in 2000) who haven't completed college, aren't working today, & aren't in school. Many of these young men, who live with their parents, are satisfied with their lot in life because there is no foreseeable employment in the manufacturing sector for them & even more pitifully they have become complacent with their situation spending their days playing video games – I personally know such a person. Source Erik Hurst – University of Chicago. Trump pledges to bring back jobs that left America for other countries – but many of these are low skilled jobs that can be done by people making pennies a day in their country. In fact part of the employment problem in the U.S. is that many low-skilled, but previously high paid, American job seekers are unqualified for manufacturing sector positions that have become more high-tech every year as automation increasingly becomes common place. There currently are 145.3 million people working in America – 22.2 million of which work for government with 12,000 added in December. Trump, as a businessman, realizes that the 123.1 million people working in the private sector are the ones who pay for the government workers – whether federal, state, or local - & that it is important to minimize the claims on the earned incomes of the private sector workers in order for the country to prosper again. We need a return to the mindset where everyone in the country understands what a job really is under a free enterprise system – namely, an opportunity to create more present or future value for an employer than it costs to maintain the worker in the job. This is why in the private sector employed people hustle. If the employee's value drops below the cost of maintaining the employee the job disappears. 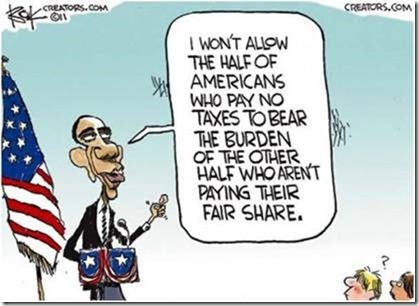 The removal of the business cost of regulatory compliance [$2.028 trillion (that's $2,028 billion) in 2012 (measured in 2014 dollars)], the lowering of both the corporate income tax rate & individual income tax rates, the elimination of both the 3.8% ObamaCare surtax on capital gains & dividends as well as the 0.9% additional Medicare payroll tax are all important steps to ensure the growth of the GDP increases from the anemic 2.1% annual growth rate over the past seven years. The annual compliance cost burden for an average U.S. firm is 21% of its payroll thereby leaving little or no room for investment of any kind. Today there are 95,102,000 people in America who do not have jobs & are not looking for one – when BO took office in January 2009 that number was 80,529,000 people. Some of the 95.1 million people are too young to work & some are too old but it still is a record number & these people need a growing economy to sustain them in their youth & their old age. There are boom periods & recessions but over a person's working lifetime (say 22 to 62) people's incomes typically take about 40 years to double in real inflation adjusted terms. The higher your starting salary the higher your final salary & standard of living by this measure. Say you started work in 1975 @ a salary of $8,000 per year when you were 22 years old. If you retired in 2015, @ age 62, you would have been making $70,400 if you doubled your starting salary in real inflation adjusted terms. Stop & think of the purchasing power & standard of living in 1975 of a $16,000 annual income – they were very good. The point is the people I described above - 25 year old unemployed or underemployed college graduates, the nearly 20% of males between 21 & 30 who are satisfied playing video games, the 1.7 million people marginally attached to the labor force, the 5.6 million involuntarily working part time, & the untold millions who were once fully employed with good paying jobs but now work for a fraction of their former pay – will either begin this doubling process @ a lower starting salary & a period less than 40 years or have had the process interrupted to their financial detriment. Trump can't get started soon enough to suit them - or me. On Friday, amidst the annoying last ditch interruptions to object & protest the proceedings, principally by Congresswomen Sheila Jackson Lee (D-TX), Barbara Lee (D-CA), & Maxine Waters (D-CA), the President of the Senate, in the presence of the Senate & the House as per our Constitution, overruled the objections, called the protests out of order, & counted the votes for President & Vice President & found that Donald Trump received a majority of electoral votes meaning there are no more legal or procedural stumbling blocks in Trump's way to the presidential inauguration on January 20. It also means it is safe to write this post. attraction to Trump's presidential candidacy started about half way through his announcement declaring his run for the presidency that I saw live on June 16, 2015. Without Trump none of the politically incorrect issues listed above would have ever been brought up @ all by any other person running for office. Yet on the morning of November 8 I doubted Trump would win, but like Peggy Noonan, I was not convinced he would lose. After all he has been a winner @ everything he has ever done. With Hillary Clinton seemingly sitting in the catbird's seat for over a year before the election the media played us for fools with their constant reports of tightening polls the last five weeks of the presidential campaign – the media (& Hillary) always thought she would win – in fact, early on election night Trump & his daughter Ivanka thought he would lose. Of course the tightening polls referred to the popular vote – a meaningless statistic, as far as the immediate election is concerned, if only evidenced by the fact that no federal government agency is in charge of compiling it. More important - the Constitution does not mention it. But in any event Hillary did not win the popular vote – when the votes were certified in all fifty states Hillary had not received a majority of the popular vote. She led with a plurality of 2,865,075 votes (65,844,954 – 62,979,879) or 48.04% versus 45.95%. Conservatives like to point out that the large national popular vote margin is due to California's results & that Trump won the national popular vote if you subtract the California walloping Trump got by 4,269,978 votes (8,753,788 California votes for Hillary – 4,483,810 California votes for Trump) or 61.48% versus 31.49%. Prior to the election Democrats were fine with any electoral system because they thought Hillary would win any way the votes were counted. Since Hillary started with a virtual certainty of 242 electoral votes & most probably 257 electoral votes based on states that had voted for the Democrat candidate the last five presidential elections (242) or four out of the last five (15 additional electoral votes) the electoral college system was tolerated by Democrats who were still leery of it after the election of 2000 when GW Bush was elected president despite not winning the popular vote. It takes 270 electoral votes to win the presidency. Hillary finished with only 227 electoral votes because - from her assumed starting point of 257 electoral votes - she lost Wisconsin (10), Michigan (16), Pennsylvania (20), Iowa (6), Maine (1), & had 5 faithless electors in the electoral college for a deduct of 58 but picked up Nevada (6), Colorado (9), & Virginia (13) for an addition of 28 electoral votes. This is now the second time since 2000 that Democrats have claimed victory in the popular vote but lost the electoral college & the presidency. Accordingly, ten states & the District of Columbia have formed a pact known as the National Popular Vote Interstate Compact (NPVIC) in which all electoral votes in these ten states & DC will go to the winner of the national popular vote regardless of who wins the individual state vote – I'm sure they consider a plurality for Hillary like in 2016 as the winner of the national popular vote. The NPVIC is planned to only go into effect, if it passes inevitable legal challenges – see Compact Claus of the Constitution, Article I, Section 10, Clause 3 which states that "No State shall, without the consent of Congress . . . enter into any Agreement or Compact with another State . . ." - when the electoral votes of the states who enter into the pact total 270 which will ensure the desired outcome. See graphic below for details of the NPVIC – note all the states & DC heavily favor Democrats so again we see that Democrats prefer the national popular vote & regard the NPVIC as an end around the Constitution & the electoral college. These states will give up their state sovereignty to get the statist president they want. Now Democrats obviously prefer to determine the president by a national popular vote because they know we are outnumbered – just look @ this last election. Conservatives say that the country needs the electoral college system because it would be unfair for one or two large states (CA & NY) with concentrated populations to dominate the rest of the country. The reason the electoral college system is needed is because the Framers of the Constitution knew that the Constitution would never have been ratified without it – the small states would not agree to be dominated by the popular vote majority of the large states. In brief, without the electoral college there would have been no ratification of the Constitution – i.e., there would be no United States. When Hillary topped out @ 232 electoral votes in the early morning hours of November 9 (for those who stayed up to watch the returns) Trump had 260 electoral votes meaning that Trump needed either Wisconsin, Michigan, or Pennsylvania to win the presidency if there were no faithless electors – a win in any one of these states would get him to 270 electoral votes. This makes the case that Trump won the election, 306 electoral votes to 232 electoral votes (before the electoral votes of faithless electors are subtracted), by winning Wisconsin (by 22,748 votes), Michigan (by 10,704 votes), & Pennsylvania (by 44,292 votes) – each narrow wins but in three states a Republican had not won since 1984 (WI) & 1988 (MI & PA). Of the original seventeen Republican candidates for president only Trump had a chance to win the presidency from the get go – & that was because he was the only candidate who could appeal to Democrat voters in states like Wisconsin, Michigan, & Pennsylvania who saw a glimmer of the return to excellence that Trump's candidacy represented to them after decades of broken Democrat promises & a life of mediocrity @ best. It truly was a narrow win & that is why the takeaway from the election should be that in order to prevent the further development of the Democrat statist ideas of government dependency that is the cause of so much misery Trump needs to win over the people Romney famously identified (Romney's 47%) as "people (who) will vote for BO (in Mitt's case) no matter what . . . these people are dependent on government, believe they are victims entitled to government handouts, & pay no income tax." In order for Trump to win in 2016 – & in particular these three long-time Democrat states - he had to already win over & receive the votes of some of these people – or else he too would have lost like Romney, McCain, & Dole did. Don't think for a second that Democrats don't know that Trump has won over some of their voters & is positioned to win more of them – as distasteful as it is to them, Democrats are not worried by a one time loss of three states by a mere cumulative 77,744 votes (out of more than 137 million votes cast) but rather what they rightly perceive as an encroachment on their territory (i.e., voters) that has the potential to grow. The best thing Democrats can do, from their prospective, is delay or disrupt anything Trump tries to do after he takes office. The backlash from this is that the next wave of Democrat voters who just couldn't quite bring themselves to vote for Trump this time, for whatever reason, may finally see that Democrat politicians, for their own political advantage, are holding people back to keep them dependent on government. In summary this is a tipping point for our country that could return us to the liberty to abundance stage of our history – we know we were not going in that direction if Hillary had won. 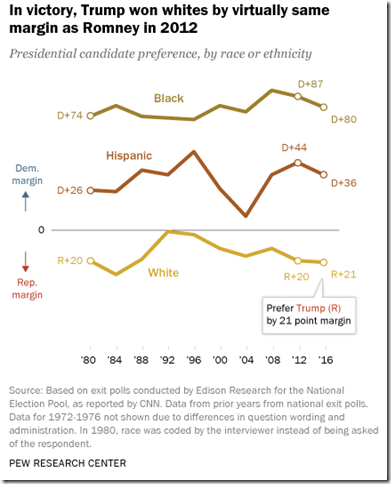 Trump got in by the barest of margins & has been given the chance to move forward. 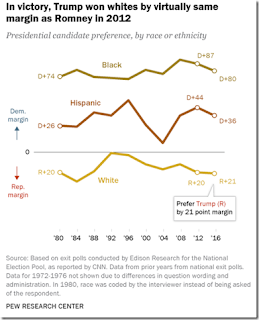 Black, Hispanic, & Asian minorities are growing in electoral importance every year. If Trump doesn't remove regulations on businesses & present free enterprise policies that will increase the growth of the economy that will allow all of these groups to participate in wealth creation the trend of minorities voting Democrat will not be reversed. Trump won Arizona by 3.50% (48.08% – 44.58%) & a margin of 91,234 votes – Romney won Arizona in 2012 by 9.03% (53.48% – 44.45%) & a margin of 208,422 votes. Trump won Georgia by 5.09% (50.44% – 45.35%) & a margin of 211,141 votes – Romney won Georgia in 2012 by 7.80% (53.19% – 45.39%) & a margin of 304,861 votes. 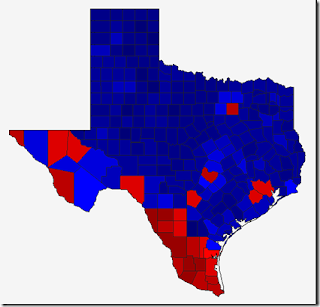 Trump won Texas by 8.99% (52.23% – 43.24%) & a margin of 807,179 votes – Romney won Texas in 2012 by 15.78% (57.13% – 41.35%) & a margin of 1,261,719 votes. Please look @ the electoral map of Texas below that shows the large number of southern border counties that voted Democrat – the usual color convention is reversed in that red signifies Democrat. Hillary Clinton won 569,744 more votes in Texas in 2016 than BO did in 2012 while Trump won only 115,204 more votes than Romney did in 2012 meaning that the Democrats picked up 454,540 net Texas voters in the last election – a troubling sign. But to show the fragility of Trump's win consider the challenge that BO made when he said he thought he would have won a third term if he would have been able to run for president against Trump. Of course we will never know but the closest we can come is to ask ourselves if we think BO would have won more than 10,704 Black or Hispanic votes in Michigan than Hillary did, & then carry the appropriate projection out in Wisconsin & Pennsylvania. To help in this projection, please look @ the following graph that shows the pertinent results from the past three presidential elections. All of the above shows the fragility of Trump's victory & the importance of Trump reversing the political correctness mindset, presenting free enterprise policies that will increase the growth of the economy, & working directly with Black, Hispanic, & Asian communities so that they finally realize the American dream. This message is to alert readers to a new post on the left hand side of RTE under Ayn Rand. Click on An Outline Report & Passages From "The Virtue Of Selfishness" by Ayn Rand which I prepared in the fall as a natural addition to the long ago posted interviews of Miss Rand by both Mike Wallace & Phil Donahue that are libertarian treasures. The new post presents the fundamentals of Ayn Rand's philosophy known as Objectivism – Miss Rand calls Objectivism "a philosophy for living on earth" that shows the greatness of man as a heroic being who lives by his own effort, achievement, & reasoning ability & does not give or receive the undeserved, who honors accomplishment, & rejects envy. 20. No man has any claim to the property of another man. A man's rights are not violated by a private individual's refusal to deal with him. Racism is an evil, irrational & morally contemptible doctrine - but doctrines cannot be forbidden or prescribed by law. Just as we have to protect a communist's freedom of speech, even though his doctrines are evil, so we have to protect a racist's right to the use & disposal of his own property. Private racism is not a legal, but a moral issue - & can be fought only by private means, such as economic boycott or social ostracism. I present this post to whet your interest in the subject matter so that you click on to read & study the entire outline report & passages & then go on to read the entire book. Learning the principles of Objectivism provides an excellent & very inspirational way to start the new year. As for me, I have lived Ayn Rand's philosophy my entire adult life, starting even before I read the Objectivist Newsletters when I was in my late-teens or early twenties - even before I ever heard of Objectivism.